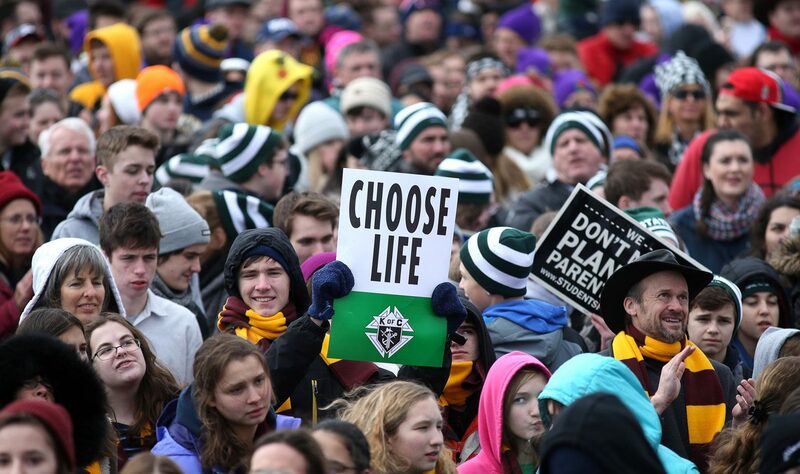 At least 3,000 women, men and young people board buses in the Philadelphia area for Washington, D.C., on Friday, Jan. 27 for the 44th edition of the March for Life. Goodness knows how many others traveled solo to the capital. Whatever the total number attending the annual march, perhaps hundreds of thousands but certainly tens of thousands, it is always an enthusiastic crowd and perhaps more so because the new federal administration is widely interpreted as being sympathetic to the pro-life movement. “It was really upbeat,” said Susan Silcox, who was captain of a busload of 48 that left from St. Dominic Parish in the Holmesburg section of Northeast Philadelphia. Their first stop was the Basilica of the National Shrine of the Immaculate Conception where Archbishop Charles Chaput celebrated Mass. Afterward the contingent headed to the Mall near the Washington Monument for a rally then marched down past the Capitol to the Supreme Court. Silcox, who has been attending the rally and march since 1985, believes all the publicity for the Women’s March earlier in the week, which definitely was not pro-life oriented, really helped to reenergize pro-life supporters. Josephine Gandolfo led a group from the Academy of Notre Dame in Villanova that left at 6:30 a.m. They also attended the Mass in the basilica then took the Metro to the nearest stop to the rally and walked from there. Her group had 40 students and some adults. As for the rally and march, she thought the people were more energized this year. “There were some political signs, but not many,” Gandolfo said. Bob McCormick, attending with St. Maria Goretti Parish in Hatfield, said his group of 51 left Hatfield at 5:45 a.m. and also attended the basilica Mass before the rally and march. McCormick is also an old hand at the march — this was his 24th time. He was impressed by this year’s speakers, especially Vice President Mike Pence. Kelly Foley, who led a group of from St. Luke the Evangelist Parish in Glenside, expects to continue marching until Roe v. Wade is reversed. She too was impressed by the appearance and talk by Vice President Pence, the highest government official ever to attend in person. “He was the greatest,” she said. Among her children in attendance was her son, Eamon, an eighth grader at St. Joseph the Protector School in Glenside. Dos Leach, who led a busload of 42 from Sacred Heart Parish in Oxford, said her group also attended the basilica Mass but the rally had already started when they got there so they just joined in. 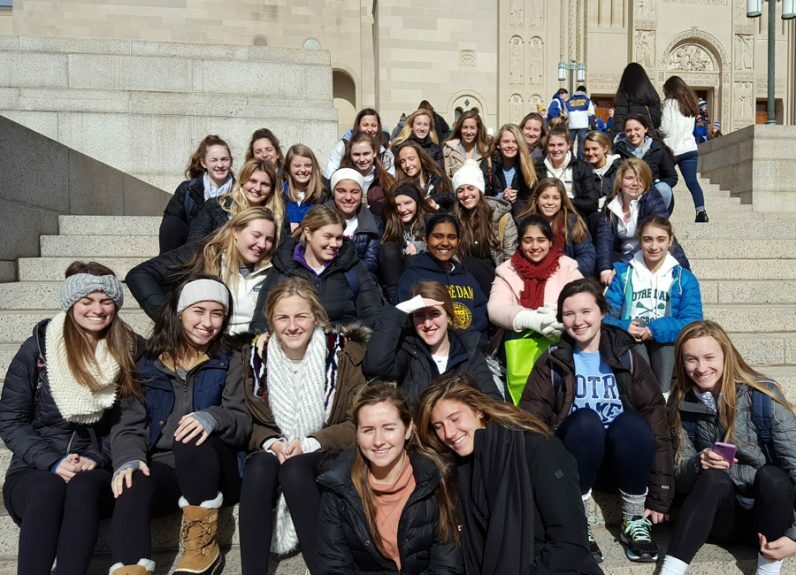 Students of the Academy of Notre dame de Namur in Villanova gather Jan. 27 on the steps of the Basilica of the National Shrine of the Immaculate Conception after Mass for Philadelphians before joining the 44th annual Rally and March for Life in Washington, D.C.